Don Dunbar, Ripley County Council President called the meeting to order promptly at 7:00 PM with Council Members Dephane Smith, Juanita Bauer, William Dramann, David Simon and Lawrence Nickell in attendance. Council Member Edward Armbrecht was not in attendance. Election of officers for the year of 2004 was the first thing on the agenda for the council. Council Member Bauer made the motion to elect Don Dunbar as president of the county council seconded by Council Member Smith. Motion approved by those present. Council Member Dunbar made the motion to elect Juanita Bauer as President Pro Tem seconded by Council Member Simon. Motion approved by those present. Council Member Smith made the motion to approve the additional appropriation of $339.65 from SISWD Fund #508-32760-000-052(Ripley County Highway Department) seconded Council Member Nickell. Motion approved by members present. Council Member Smith made the motion to approve the additional appropriation of $30,000 from General Fund (Ripley County Sheriff Department) for Deputies Holiday and Overtime seconded by Council Member Simon. Motion approved by (5) five members Dunbar, Smith, Simon, Bauer and Nickell and (1) one member abstain (Dramann). 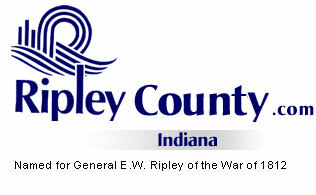 Bill Davison, Ripley County Sheriff presented the County Council with his Jail Commissary Fund Report for 2003. Council Member Smith made the motion to approve the additional appropriation of $423.00 from Fund# 246-12401-000-040 Adult Probation User’s Fees (to correct deputy position raise of $500 for 2004) and additional appropriation of $1,083 from Adult Probation User’s Fees (increase position salary to be comparable to the 3rd & 4th deputy salary) Ripley County Probation Department seconded by Council Member Nickell. Motion approved by members present. Council Member, Smith made the motion to approve the additional appropriation of $180,000/ EMS (Fees) Funds seconded by Council Member Simon. Motion approved by members present. Council Member, Smith made the motion to approve the additional appropriation of $225,000 from Belterra Riverboat Fund/for Belterra (Riverboat Fund) Budget (for the Jail Bond Interest Payment 2004) seconded by Council Member Simon. Motion approved by members present. Council Member Nickell made the motion to use EDIT money for the new EMS Garage/Driveway seconded by Council Member Smith. Motion approved by members present. Council Member Bauer made the motion to approve the additional appropriation of $420,000 from (Rising Sun) Riverboat Gaming Fund for the EMS Budget seconded by Council Member Nickell. Motion approved by (4) Council Members Simon, Bauer, and Dunbar & Nickell and (2) against Dramann & Smith. EMS Budget balance of $150,000 will be decided at a later date. Council Member Smith made the motion to approve the amended Salary Ordinance for the Highway Department/Maintenance & Repairs seconded by Council Member Nickell. Motion approved by members present. Council Member Smith made the motion to approve the amended Salary Ordinance for Ripley County EMS seconded by Council Member Simon. Motion approved by members present. Council Member Smith made the motion to adjourn until the next regular meeting on the 17th of February, 2004 @ 7:00 PM in the Ripley County Annex seconded by Council Member Simon. Motion approved by members present.